Clockwise from the top left: First United Methodist Church (1861), Old Harrison County Courthouse (1900), Texas & Pacific Depot (1912), Ginocchio Hotel (1896). Join Preservation Texas for a day of discussion, networking and tours related to the challenges and opportunities of saving historic railroad depots and related historic resources in Texas. Speakers include architects, preservationists and community advocates who will share their own experiences and answer questions from participants like you. Thank you to our sponsors and everyone who participated. It was a big success. Registration closed. See you in Waco! Born in Marshall, with education from Texas A&M and Baylor Law School, Richard Anderson is an attorney, businessman, rancher, and former Harrison County Judge and Texas State Senator. 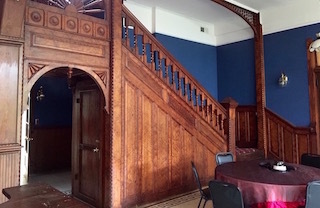 Historic preservation has been an important part of Anderson’s life. In 1976, he purchased and renovated Edgemont, a Harrison County residence built in 1845. It was placed on the National Historic Register in 1977 and recorded Texas Historic Landmark in 1981. He and his wife, Christina, continue to live there today. 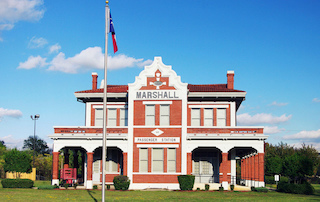 Richard and Christina Anderson also partnered with Jerry and Judy Cargill on the renovation of the 1929 Hotel Marshall and, in 2013, gifted the renovated property to East Texas Baptist University to house a graduate program. As County Judge, Anderson took over the supervision of the restoration of the 1901 Harrison County Courthouse from 2007-2009, with completion in June, 2009. Knowing the importance of ongoing maintenance of restored historic buildings, Anderson, as County Judge, structured a $1.4 endowment for the courthouse through the sale of historic tax credits. The endowment is designed to assist Harrison County with the ongoing preservation of the restored Courthouse in perpetuity and is the only endowment of its kind for a county courthouse in the state of Texas. Perky Beisel is an Associate Professor in the History Department at Stephen F. Austin State University. Her research interests include the Gilded Age, stable architecture, and cemetery preservation. She is the co-director of the Public History M.A. program which trains students in the historic preservation, museums, archives, and oral history fields. Since joining the faculty at SFA in 2005 she has completed numerous projects in cooperation with the public including a county-wide cemetery survey in Houston County, updating and digitizing the Angelina County Historic Sites Survey and City of Nacogdoches Historic Sites Survey (both originally conducted in 1986), and processing over 100 oral history interviews in the Bobby H. Johnson Oral History Collection. Perky served on the board of Millard’s Crossing Historic Village, Inc. for nine years and is currently a member of the Nacogdoches Historic Landmarks Preservation Commission, the VP of the Friends of Historic Nacogdoches Inc., the president of the Texas Oral History Association, and board member of the Association for Gravestone Studies. She earned her doctorate at Middle Tennessee State University in Historic Preservation in 2005. David Bucek holds a B.Arch from the University of Houston and an M.Arch from Harvard University’s Graduate School of Design. A champion of good design past and present, he has taught at the University of Houston and the University of Texas at Austin. He serves on the board of Preservation Texas, AIA Houston, Houston Mod and as a commissioner on the Houston Archaeological and Historical Commission. He and William Stern formed Stern and Bucek Architects in 1999, after many years of working together at William F. Stern & Associates Architects. Mary Hendricks moved to Marshall, Texas in 2003 and fell in love. She renewed her love of history and focused her efforts on the Texas & Pacific Depot and its rich contribution to Marshall. She organized and supervised a model train show that was in the local convention center for seven years from 2004 through 2011, forging many lasting relationships with the City of Marshall and around 75 vendors. In 2005, Mary was appointed by Harrison County Judge Wayne McWhorter, to the fourteen-county East Texas Rural Transportation Committee. The Committee helped the T&P Depot receive funding from TXDOT for improvements including a wheelchair lift. She also worked with the East Texas Council of Governments to create a Marshall To-Go Bus that services the rural area provides transportation for needy people. A graduate of Texas A&M University and 5th generation railroader, this is Griff Hubbard’s 45th year in the industry. He is currently the revenue manager for Amtrak’s Chicago to Los Angeles Texas Eagle and Amtrak’s Fort Worth to Oklahoma City Heartland Flyer. He is also a member of the board of directors on the Texas State Railroad Authority and is Executive Director of the Ark-La-Tex Corridor Council, Inc. for higher speed passenger rail along the I-20 corridor. Having begun his railroad career as a track laborer, Griff came up through the various ranks of service between Texarkana and Fort Worth and Longview and Palestine. He is the last original Texas & Pacific Railway employee remaining in active Amtrak service. Kate Johnson has been a preservation advocate for many years. She has served as Chairman of the Hays County Historical Commission since 1999. 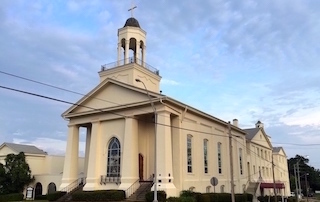 As chairman, the commission has listed numerous properties to the National Register of Historic Places, erected many Historical Markers, and produced over a dozen historical documentaries on the county’s history. 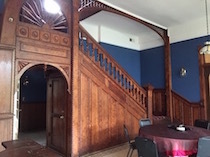 Kate played an instrumental role in the restoration of the Katherine Anne Porter Childhood Home in Kyle, the Old Hays County Jail in San Marcos, the Winters-Wimberley House in Wimberley, and the Depot in Kyle. She has served on the boards of numerous non-profits devoted to historic preservation around Hays County, including the Wimberley Institute of Cultures, the Kyle Train Depot Committee, Old Town Kyle Advocates, and Preservation Associates, Inc. – a county-wide non-profit association devoted to the preservation of historic and cultural resources. She also founded the Historic Bridge Foundation, a national non-profit foundation devoted to the preservation of historic bridges across the United States. Kate was the 2010 recipient of the John Ben Shepperd Leadership Award and the first recipient of the Kate Johnson Award for Volunteer of the Year, which is named in her honor (2015). Originally from Connecticut, Evelyn Montgomery graduated from Texas Christian University, with a degree in interior design. She later got her M.Arch. from the University of Texas in Arlington and a Ph.D. in History from University of Texas Dallas. She began working at Dallas Heritage Village in 2001 as a tour guide, later becoming curator of collections and then director of collections, exhibits and preservation. Montgomery oversees repair work of the Village’s historic structures as well as takes care of artifact collections, creates exhibits, and does public speaking on historical topics. In addition to speaking to local groups, Evelyn has presented four times at the Dallas History Conference and at state and national conferences. Active on her neighborhood association board of directors and vice president of the Dallas Homeowners League, she also serves on the Dallas Landmark Commission and is a volunteer with Preservation Dallas. Presently, she is writing and editing a collaborative book for Texas A&M University Press called “The Historic Villages of Texas” about the historic structures preserved in six village-style museums across the state, including Dallas Heritage Village. In June 2013, Marty Prince was named Executive Director for the Texas Forest Trail Region. She obtained a BFA from UT Austin and Masters from the Mount Royal School of Art at MICA in Baltimore, Maryland. She has 19 years marketing and graphic design experience, and previously served as Tourism Coordinator for the Nacogdoches CVB, Marketing Director for the Fredonia Hotel & Convention Center, and Communications Director for Nacogdoches ISD. Marty is a Nacogdoches native, who moved “back to Nac” in 2005 and married her high school crush – Kendal in 2006. Kendal has a green thumb and Marty has a passion for power-tools. Their weekends are spent working in the garden and “fixing-up” their historic home built in 1885. Mercy Rushing is a Certified Community Developer and Certified Tourism Executive with 22 years’ experience in Municipal Government focusing on Community & Economic Development with an emphasis on Downtown Development & Restoration Program & Projects. She was in charge of the restoration of downtown streetscape, historical museum development and the depot transportation project for the City of Mineola. She is currently serving as the City Manager and Executive Director of Mineola Economic Development Corporation. Mercy was very active in the Texas Downtown Association and served on the Executive Board of Directors for 3 years and is a proud recipient of the 1997 Amtrak Presidential “Champion of the Rails” Award and was also named the 1999 Texas Historical Commission’s “Main Street Manager of Year”. Evan R. Thompson is the executive director of Preservation Texas. Prior to joining PT in 2014, he served for four years as executive director of the Preservation Society of Charleston and served for six years as executive director of Historic Beaufort Foundation, both in South Carolina. He is a graduate of The University of Texas School of Law and the University of Richmond. In 2011, he was the inaugural recipient of the National Trust for Historic Preservations’ American Express Aspire Award, recognizing an emerging national leader in the preservation field. Greg is a graduate of Ohio University with a degree in Communications. His wife Charis and two year old son Hudson are enjoying life in East Texas. His plan for the Texas State Railroad is to continue to improve on its train ride offerings to keep it on the growth path it has enjoyed the last several years under Iowa Pacific Holdings… and keep this true Texas Treasure stable for Texas families to enjoy for years to come. Leslie Wolfenden is the Historic Resources Survey Coordinator for the Texas Historical Commission where she manages the Historic Texas Highways and Historic Resources Survey programs since 2013. Prior to that, she worked as a project design assistant for the THC Texas Main Street program for two years. Before coming to the THC, she worked for four years in the private sector for environmental consulting firms, where she conducted a broad range of historic resources surveys. Leslie volunteers for Save Austin’s Cemeteries, a non-profit organization that is dedicated to preserving historic cemeteries in Austin through documentation and education, and recently ended a 3-year term on the City of Austin’s Historic Landmark Commission. She has a Master’s in Historic Preservation from the University of Texas Austin, a Bachelor’s in Architecture from the University of Texas Arlington, and an Associate’s Degree in Interior Design from Bauder College. Carrie P. Woliver is an author, independent television producer, singer, and founder/president of Friends of the Orange Depot in Orange, TX. Married almost 50 years to Ronald Woliver she is a proud grandmother of two precious grandsons. Carrie, a native of Orange who resides in Houston, found in 2010 the old 1917 dairies of her grandparents and decided the historical information needed to be shared. So she went to work writing a book about them. Her grandparents, the Joiners, lived right by the railroad tracks so she named her book “The Train Stopped in Orange” (available on Amazon.com). Carrie is always happy to share the story of how writing that book has led to the restoration of the 1910 Southern Pacific Depot and how the community effort to save the depot is uniting the city.